1) First wash your left hand. 2) Then wash your right hand. 3) Finally cup some water in your left hand and use it to rinse out your mouth. The right hand was considered to be more impure than the left, hence the use of ones left hand as a cup. It is traditional to wash ones hands before praying at a Shinto shrine where purity and cleanliness is considered to be of utmost importance. Students from the Kokugakuin University which has a department to train shrine priests also left a little bit of water in the ladle and by tipping the ladle upwards arranged for this final egg-cup-full of water to run down the handle of the ladle, thus washing it for the next user. 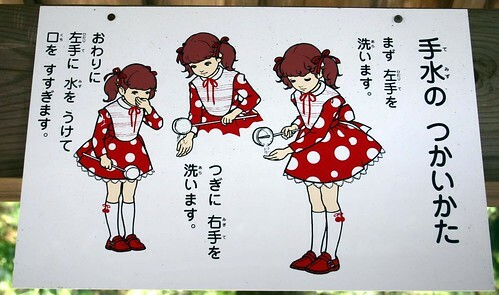 This page at the website of Tsukubayama Shrine explains the hand washing (and Shinto prayer) process in full, and also recommends that one bow at the "sacred washbasin" before and after washing ones hands. In Shinto, being animistic, one expresses ones gratitude to everything including washbasin. Japanese would traditionally wash their hands before praying at a shrine and clean their whole house at the end of the year (oo-souji, or "the big cleaning") in a winter equivalent of a "spring clean." It was traditional in Tokyo at least to replace the "goza," smooth woven covering of tatami mats and add a new layer of Japanese paper on internal sliding screen doors. If you carry out this sort of spring clean, as I have done, the New Year can feel like a rebirth, as it is claimed to be.